History: Rahne Sinclair was was born into a highly sequestered world. Much of her early life was dominated by regiment and discipline. This sequestered life was a product of a family that raised and conditioned her with an iron fist. This conditioning as well as her mutant nature would clash on many occasions. 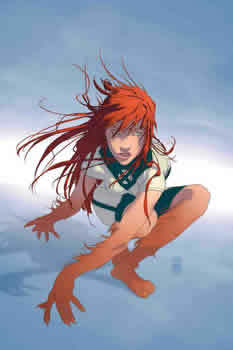 Rahne was the fourth child of Craig and Christina Sinclair. Both were former missionaries who had been expelled by the Anglican Church for their radical and often subversive style teaching. As a result, they formed a tightly nit band of religious zealots in a small, rural town in northern Scotland. Both parents were extremely controlling of her and her siblings. Every day was highly regimented, consisting of pre-determined meals, homeschooling, and chores. While her siblings and much of the community feared their parents’ wrath, Rahne showed an early inclination to resist such control. She developed a reputation for being temperamental, which earned her plenty of discipline from her parents. While they rarely punished her physically, they often locked her within a small basement cellar. There were times when Rahne had to spend days on end within these cellars. As she grew older, these punishments took a toll on her and led her to resisted her parents’ control more vehemently. One of the ways in which she opposed them was to sneak books and newspapers in from outside her isolated town. She often coordinated with other children in her town who also didn’t care for the subversive doctrines. Together, they would read over forbidden texts in secret. Early on, Rahne showed a keen interest in animals. Her love of dogs and wolves earned her the nickname Wolfsbane by her peers. That name would stick in more ways than one as she entered adolescence. When Rahne was 14-years-old, she was caught by her parents with one of these forbidden books. Her had to restrained her with a rope while her mother burned the book in front of her. This left Rahne so upset that her mutant powers began to manifest. She sprouted canine-like teeth and started growling like an animal. Fearing that she had become corrupted by the book, they tied her up and locked her in the cellar for four days. During that time, Rahne’s anger turned to an animal-like rage. As a result, her entire body began to erratically morph between a human and a wolf. She eventually settled into a half-human, half-wolf figure and was unable to shift out of this state. When her parents finally let her out, they were horrified. They believed Rahne had been possessed by a demon and bound her with heavy shackles in the basement. Eventually, the entire town found out about her transformation and tried to conduct a mass exorcism. This only served to enrage her feral instincts even more. It led her family to disavow her as her daughter and as a member of the community. But rather than simply set her free, they sought outside help from a man named Black Tom Cassidy. During this time, Black Tom was involved in a growing human trafficking ring. Part of that ring catered to more exotic tastes in clients, which included mutants. One of his associates referred the Sinclairs to him and they were all too eager to give him Rahne. When Black Tom took her, he kept her in chains just as her family had done. However, life with Black Tom proved every bit as harsh as he and his daughter, Siryn, hoped to train her into being an obedient “pet” of sorts. This training involved her being confined in a special holding cell. The bulk of the conditioning came from Siryn, who tried to use her powers to subvert her rebellious inclinations. But as was the case with her family, Rahne resisted this vehemently. It’s not clear how long this conditioning went on, but it didn’t last long enough. Black Tom’s trafficking operation had already been under surveillance by various European authorities. So while Rahne was still being conditioned, a daring raid was conducted. The leader of the raid was Black Tom’s own brother, Sean Cassidy. He managed to fight through the facility where Rahne had been imprisoned. When he found her, he freed her and she was able to lead him to the rest of his trafficking victims. She then tried to lead him back to Black Tom, but he unfortunately escaped. Rahne was now finally free, but without a home. She was also still stuck in her half-canine form, leading Sean Cassidy to assist her. He took her to Moira MacTaggert and Charles Xavier, who helped her gain control of her abilities. By the time she was 15, she could fully shift from human to wolf. In the process, she grew close to Sean who ended up adopting her as his daughter. She would go onto build a new life at the Xavier Institute for Higher Learning, taking part in the early training of the X-men. Her new adopted father opposed her becoming part of the team. But unlike her birth parents, he didn’t force her to stop. Adopting the codename Wolfsbane, Rahne would go onto serve in the X-men on a regular basis. However, Rahne’s X-men duties were often interrupted by the growing struggles of Moira’s son, Kevin. As her adopted father grew closer to Moira, she in turn became part of her family as well. It led her to forge a close bond with Kevin, who had endured a similar struggle with his powers. When Sean left the Xavier Institute to manage Muir Island with Moira, Rahne scaled back her role with the X-men significantly. After Kevin’s powers became so unstable that he had to be kept in an isolation chamber, she left the Xavier Institute completely and moved to Muir Island. Rahne continued to grow closer to her adopted family and did her best to help Kevin through his struggles. However, his powers kept growing increasingly unstable, causing him to become withdrawn and detached. This led Moira to conduct an ill-fated experiment with a device crafted by the mutant inventor, Forge. The experiment failed and caused Kevin to go on a rampage in Liverpool, England under the new title, Proteus. This led Rahne to join forces with the X-men once more to stop him. However, the battle ended tragically with Kevin taking his own life. His loss hit Moira and Rahne hard. The effects of such a loss on Rahne are not yet known as she remains uncertain of her future. Character Breakdown: Rahne’s personality is a unique dichotomy of human and animal-like inclinations. This stems primarily from her powers. Being part wolf, the baser instincts of a canine are inescapably present in her. However, the circumstances of her youth shifted those inclinations from that of a wild animal to that of a caged animal. Her birth parents were largely responsible for this. While they may not have been abusive, they were very controlling. So even before her powers manifested, she was still caged in a sense. Then when her powers manifested, they attempted to contain her like an animal. But even if she never escaped, she never stopped seeking freedom from her proverbial cage. She clearly resented her birth parents, but did not act on that resentment until they abandoned her. This desire to attack her oppressors is not unlike that of an animal that has been cornered by predators. Some fight back while others accept their fate. Rahne came dangerously close to accepting her fate after her parents sold her to Black Tom’s trafficking ring. Then Sean Cassidy came in and saved her from that fate. In many ways, being a caged animal gave Rahne an important appreciation for freedom and for opposing oppressors. Attacking those oppressors became a motivating factor for her early years in the X-men. Unlike her parents, her adopted family and Professor Xavier taught her to channel both her human and canine instincts. The human part of her seeks to embrace those who allow her to be free. For the animal part of her, it’s not unlike a wolf that finds itself in a new pack. It also helps her form strong attachments. She has a clear affection for Sean and Moira. She also shows a great deal of empathy and compassion for Kevin, who was caged like she was by her powers. Both her human and animal instincts work in harmony to selectively embrace the necessary elements that allow her to be strong, cunning, and independant.